Get on the path to an exciting, evolving career that is predicted to grow sharply into 2025 and beyond. Artificial Intelligence and Machine Learning will impact all segments of daily life by 2025, with applications in a wide range of industries such as healthcare, transportation, retail, insurance, transport and logistics and customer service. The executive programme in Artificial Intelligence and Machine Learning will help you become an expert in the exciting new world of AI & ML by learning through cutting edge technologies and work on real-life industry grade projects. The programme is designed for executives who would like to participate in Kaggle Data Science challenges or look for data-heavy context to conduct analysis, produce insights, and deploy a system that does useful work in the competitive environment. AI, Machine Learning and Deep Learning are attracting more traction lately because of the recent innovations that have made headlines, Alexa, Siri, Humanoids, Chatbots, Robotics are some to name a few. The varied applicability of AI in a multitude of industries including entertainment, transportation, finance, retail etc. makes this technology a hot job and career destination. According to Analytics Insight, experts predict that AI alone will generate close to 2.3 million jobs by 2020. However, additionally, it is predicted that this technology will take away over 1.7 million jobs, leading to a net addition of half a million new jobs worldwide. Programme content and structure designed by IIM Kozhikode. 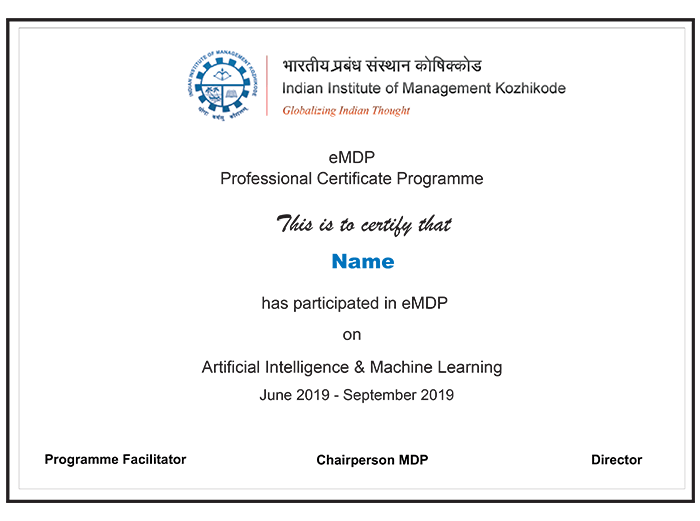 Hands on practical exposure on trending domains like AI, ML, DL etc. for AI and ML, or simply the urge to learn. Working professionals looking forward to upskill to a Data Scientist job role or to gain effective decision making in the current job role. Graduates in any discipline with minimum 2 years of professional work experience and familiarity with computer programming. 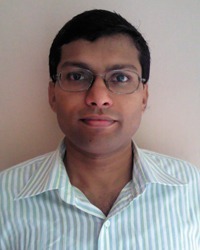 The lectures will be delivered by eminent faculty from IIM Kozhikode. The approach combines live lectures, application exercises with hands-on practice for some sessions and instrumented feedback with a strong emphasis on concepts and theory. The sessions will be delivered from IIM Kozhikode studio on TPL technology platform to participants who would be attending from their respective places via their device (Laptop/Tablet). A minimum of 75% attendance to the LIVE lectures is a prerequisite for the successful completion of this programme. There are periodic evaluations built in throughout the duration of the program. These maybe in the form of a quiz, assignment, project, case studies or other objective/subjective assessments. Participants who successfully complete the same and satisfy the requisite attendance criteria, will be awarded with a Certificate of Completion from IIM Kozhikode. Participants who are unable to clear the evaluation criteria but have the requisite attendance will be awarded with a Participation Certificate from IIM Kozhikode.